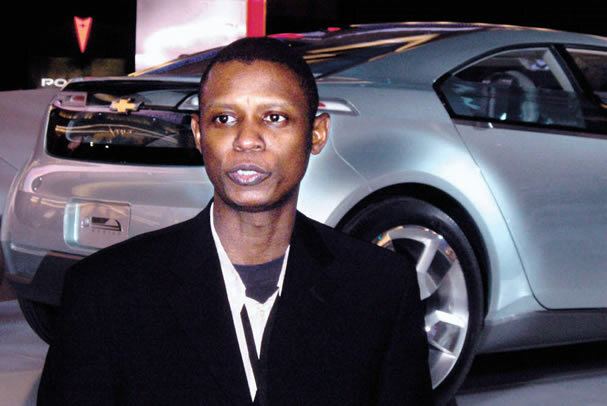 Jelani Aliyu, hails from Sokoto State, Nigeria and is General Motors’ Lead Exterior Designer and the designer of the Chevy Volt. General Motors is the world’s largest automobile maker. The car has been described as an American Revolution and one of the hottest concepts in the design line. Jelani was born in 1966 in Kaduna, to Alhaji Aliya Haidara and Sharifiya Hauwa’u Aliyu. The fifth of seven children, theirs is a very close-knit family. For him, it was an amazing experience growing up in Sokoto, surrounded by the rich culture of the people and the state and enjoying excellent access to the latest and international information From 1971 to 1978, he attended Capital School, Sokoto, an excellent school and this served as a very productive educational experience for him. In 1978, he gained admission into Federal Government College, Sokoto, from where he graduated in 1983 with an award as the best in Technical Drawing. He began his A-levels in Ahmadu Bello University, Zaria, but later dropped out and enrolled in the Benin Kebbi Polytechnic, Kebbi State, bagging an OND in Architecture in 1988. In 1990, Aliyu proceeded to study Automobile Design in Detroit, at the College for Creative Studies on a Sokoto State scholarship. He graduated in 1994, before which, he won two awards from Ford Motor Company and Michelin, US. Jelani Aliyu is one of the creative minds that beams so much pride for Nigeria. He is the creative mind behind the Chevrolet Volt, which has become one of the most admired American cars globally. His rise in the global automobile industry is quite like a fairy tale, after ending, as the car designer. Today, Jelani Aliyu is the senior and lead exterior designer at General Motors – the second largest car manufacturer in the world – a company he joined in 1997. With all Jelani’s career successes such as, working on several successful models including the stunning Pontiac G6, as well as a national award as member of the Order of the Federal Republic (MFR) in Nigeria (2012), he is also hoping all the attention he’s getting will inspire other Nigerians to pursue their dreams.